As the date approaches in March when our temple hosts a large-scale chanting and prayer ceremony for the Buddha Mother Great Peacock Wisdom King Sutra (i.e., the Mahamayuri Vidyarajni Sutra), I have been frequently asked what kind of classic the sutra is and what its historical origin and scripture sources are. 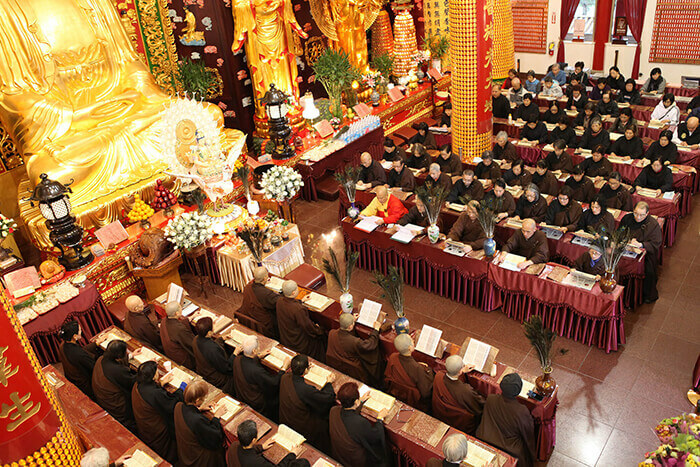 Since our International Buddhist Temple already has an established schedule of regular ceremonies, some friends wonder why we need a special ceremony to address this sutra. Attempting to answer some of their questions, I am going to offer what I know for the sake of discussion. Please enlighten me with your wisdom where I am inadequate. The Buddha Mother Great Peacock Wisdom King Sutra, listed as No. 982 in Volume 19 of the Taisho Newly-Published Tripitaka, was translated by tantric master Bukong of the Tang dynasty. Together with the Benevolent King Sutra (Karunika–raja Prajnaparamita Sutra) and the Lord of the Nation Protection Dharani Sutra (Aryadharanisvararaja Sutra), they make up the three Buddhist classics for nation protection against misfortune. Now let us try to parse the meaning of the sutra title: Buddha Mother Great Peacock Wisdom King Sutra. Buddha Mother: a metaphor for Buddha making, the way a mother bears a son. Great Peacock: depicting the function of the sutra, where “great” means supreme or best. The peacock is known to feed on poisonous plants and insects, which cannot harm the bird itself but make its feathers rich in colour and lustrous. The bird being a metaphor, its morality signifies awesome virtue, capable of ridding sentient beings of delusions and all other kinds of mental trouble. In this sutra, Buddha told Ananda, “This peacock king is my body”. It shows that this Great Peacock is not an ordinary peacock, but a sacred one mutated from Sakyamuni Buddha. Wisdom King: with wisdom everything is lucid without a barrier, and being a king means the most respected, the supreme, who enjoys total freedom. Put together, they mean that with its special merits and virtues this sutra can rid sentient beings of greed, anger and delusion, enable them to attain the Bodhi and reap total freedom with no restraint. So named, it is a Bodhisattva from tantric Buddhism, known in Sanskrit as Mahamayuri Vidyarajni. This bodhisattva has a benevolent countenance, and with four arms holding flowers, fruits and peacock tails, it rides a golden peacock. The first hand on the left holds an auspicious fruit symbolizing gain. The second hand on the left holds several peacock tails, symbolizing the overcoming of misfortune. The first hand on the right holds a blossoming lotus flower symbolizing adoration. The second hand on the right holds matulunga, i.e., a citrus fruit, symbolizing subjugation. Legend has it that the Peacock approach to Buddhism prevailed early in India. According to the World Buddhist Classics Translation Series, when Master Xuanzang (602-664) arrived in India in the seventh century, the Great Peacock Sutra was already a popular text for chanting. Before the Indian emperor Harsha (590-647) was enthroned, for instance, on hearing that his father had died, he rushed to the palace, to find the teachers in the middle of a ceremony, where many of them were chanting Peacock verses. That is an indication of how popular the sutra was at the time. And before that, according to A Chronology of the History of Buddhism and the World Buddhist Classics Translation Series, Kuchean Prince and monk Po Srimitra gave up the throne on becoming a Buddhist and came to China in 307. He stayed at Jianchu Temple in Nanjing and translated into Chinese the Peacock King Mantra Sutra for the first time, which survives today in major Buddhist texts such as The Tripitaka and Tripiṭaka Koreana. In 516, Khmer Buddhist Master Samghapala (460-524) travelled to China and translated into Chinese the Peacock King Mantra in the Words of Buddha. In 705, Master Yijing (635-713) translated the Great Peacock King Mantra in the Words of Buddha. And later, Master Bukong (i.e., Amoghavajra, 705-774) produced yet another translation entitled the Buddha Mother Great Peacock Wisdom King Sutra, which, in fact a revision of the text by Yijing, is widely used today. In 746, Master Bukong was staying in Jingying Temple, when there happened to be a drought. The emperor ordered a three-day Peacock Dharma prayer ceremony be held in an imperial Buddhist facility to implore rain and consequently, rain it did. Upon that the emperor granted him an honorific title Zhizang, and gifted him with a purple kasaya. Since then, the royal family of the Tang dynasty paid much attention to this Buddhist classic and extensively practiced it while keeping it from being circulated. Later, the sutra somehow went to Japan, where Master Kukai emphasized its nation protection and misfortune quelling characteristics and made it a classic for Japan’s Shingon school of Buddhism which he founded. From then on, it was used in ceremonies typically to pray for rain against disasters. During the eleventh century, this sutra began to involve worldly personal benefits, and gradually became widely popular with its powers of granting blessings, eliminating natural disasters, removing diseases and prolonging personal lives. More recently, its promotion in Taiwan was led by Monk Hsien Tun (1903-1986). In Miaoli’s Tzukuang Temple one of the nuns Huikuan was suffering from serious illness. Miraculously, she was healed by the monk’s repeated chanting of the Buddha Mother Great Peacock Wisdom King Sutra. When Venerable Chienju heard the news, he was able to learn the sutra from Monk Hsien Tun and apply it in his cultivation. This resulted in having years of his stomach pains cured, and made him committed to spreading the sutra for the benefit of other people. Upon his dedicated studies, his conviction of its extraordinary power grew further and he became determined to use the sutra as a tool to save fellow sentient beings from their sufferings. However, the many long mantras with uncommon and obscure Chinese characters make the sutra hard to chant. After a new type-set, Professor Chuang Hsi-ching worked to add a phonetic text with Mandarin, Japanese, and Wade-Giles Roman transliteration. This took over ten years and let to the publication of an initial Kaicheng Edition. In all Venerable Chienju spent 30-odd years promoting the Great Peacock Wisdom King Sutra and surmounted many obstacles in the process. In his later years, aided by Jungyung Acarya from the Chuin-ryu Lineage of Koyasan Shingon Buddhism and the well-known Siddham expert Professor Lin Kuangming, he was able to officially complete the arduous project of re-editing the sutra in 2010, producing a Sanskrit text for chanting marked with the International Phonetic Alphabet. There is sometimes a layman’s question: since our Temple has an established routine of chanting ceremonies and prayer sessions, and its abbot has a busy schedule overseeing charitable work while promoting the Dharma, why do we need to hold a special chanting ceremony for the Great Peacock Wisdom King Sutra? According to historical statistics and experts’ estimation, Greater Vancouver may have a major earthquake coming. As a local Buddhist organization, we try to do our best for the welfare of the community, and praying for the elimination of natural disasters benefits community building and helps residents live and work in peace. Therefore, for many years our abbot, Venerable Guan Cheng, has been searching for a relevant Buddhist classic with special powers to be used for appropriate merit transference. The Great Peacock Wisdom King Sutra, with its misfortune elimination capacity, would be an excellent karmic fit blessed by Buddha. Our abbot repeatedly reminds us that in the past year alone Greater Vancouver has been hit by several hundred earthquakes. These are, of course, of varying degrees, but their frequency suggests that the crisis of a catastrophic major earthquake in the area is approaching. In addition to religious significance, hosting a chanting and prayer ceremony has a constructive social dimension. If we raise people’s awareness, then we may be able to alleviate or even avoid the harm caused by disasters. This is the main reason why we are planning such a ceremony. Earthquakes and typhoons are all natural disasters. In the Dharma, they belong to karmic consequences arising from collective deeds by sentient beings. The scripture tells us: “Greed, anger and delusion being the world’s three poisons, the Buddhas have so decided and said explicit words to expel them all.” These poisons are so bad that they hurt human health and break roots of good karma. On a larger scale, they even wipe out enlightened lives and affect the environment with the earth’s ecology. The Peacock sutra affords an approach for people to pray with considerable effects for the relief of natural disasters. We should cherish the opportunity and be grateful to the Three Gems for the Five Precepts and Ten Commandments. In this way, we gain power for auspicious weather taking out even natural disasters. For that reason we are appealing for people of different ethnicities, languages and faiths to come together and participate in our Buddha Mother Great Peacock Wisdom King Sutra Dharma ceremony in March, where we pray together for the elimination of natural and man-made disasters and for peace in the community, and sow seeds of good karma for individuals and families. Through chanting, one may also repent their own greed, anger and delusion, receive blessings from the Buddhas and Bodhisattvas, and plant roots for compassion and benevolence. Buddhism attaches great importance to building relationships through karma. At this auspicious ceremony, one chants the pertinent verses with the congregation, and sends thoughts of sincere compassion that are overwhelmingly heartening. With such an altruistic deed, we hope attendees will gain a beneficial return reaping protections by both the nagas and devas.